Retaining customers isn’t easy, but it’s important to do for businesses of every size. After all, the sure fire sign of a healthy brand is a growing number of repeat purchases from already existing customers. The above is a screenshot of BigCommerce’s out-of-the-box ecommerce analytics Customer report. You can clearly see the number of new vs. returning customers. A 50/50 split like the one above is a great place to be for a brand. And you can clearly see this particular brand is heavily focused on increasing returning customer spend. This is because earn net new customers is expensive. It often takes advertising to acquire –– and if they don’t come back to purchase again, you’re return on ad spend stays steady, rather than increasing over time. It also means your customer lifetime value is low (which decreases how much you will be willing to spend on advertising –– and thus will limit your ad visibility). Growing your customer lifetime value and building long term customer loyalty takes time, though. It can’t be created overnight. It also isn’t rocket science. Earning increased repeat business and building customer lifetime value is doable –– and you can start right now. First, know that it takes business investment to make LTV a core and measured metric. It must be part of your overall business strategy. This isn’t about a monetary investment. No, you need to invest time in building ways to track and measure your LTV over time. There are many ways to build customer lifetime value, but first, let’s define it to make sure we are all on the same page. Customer lifetime value, commonly referred to as LTV or CLV, is a business metric that estimates the total predictable repeat purchase rate of a customer over the lifetime of their time with your brand. The higher your brand’s LTV (lifetime value) is, the more valuable it is considered in the market. This is because acquiring net new customers is expensive –– and if a customer only purchases from you once, your return on ad spend (ROAS) doesn’t increase over time. Customer lifetime value informs nearly every business decision, but none more than ad and marketing spend. First, you need to nail down the CLV that will be your north star. There are several ways to do this, but more importantly than which method you go with is consistency once that decision is made (for more on manually calculating CLV, Ometria has an excellent tutorial). If you are a BigCommerce customer, you can use your Analytics to download and then sort your customers by purchase date. Easily configure customer lifetime value (LTV) by exporting your customer groups and viewing total spend with your company on a customer cohort level. You can even do it by each individual customer. Better yet, if you are an Insights customer, you get immediate cohort access to customer LTV in a variety of reports. BigCommerce Insights offers 6 LTV reports with easily downloadable cohorts you can use to target ads or emails to increase repeat purchasing rates, or find lookalike customers. If you aren’t using BigCommerce, you can still get at this information by using your store analytics tool to download customer purchase and order history, and then match repeat customers. You may need to build out your own formula or combine multiple sets of data to get at your customer repeat purchase rate. CLV (or LTV) should inform nearly every business decision, but none more so than ad spend. The bang you get for your advertising buck is inextricably tied to what you can expect every customer to bring you in the long term — not just their first time purchasing from your store. When you combine LTV with other metrics like retention rate, customer acquisition cost, churn rate, net profit and ROAS, you start to get a very clear picture of what you can do to improve margins. A low average ROAS will influence how much you spend on advertising –– likely meaning you won’t be able to afford to bring on net new customers at scale in the long run. For example, a company that spends $2,000 on an online advertising campaign in a single month. In this month, the campaign results in revenue of $10,000. Therefore, the ROAS is a ratio of 5 to 1 (or 500%) as $10,000 divided by $2,000 = $5. What is a good ROAS? An acceptable ROAS is influenced by profit margins, operating expenses, and the overall health of the business. While there’s no “right” answer, a common ROAS benchmark is a 4:1 ratio — $4 revenue to $1 in ad spend. Cash-strapped start-ups may require higher margins, while online stores committed to growth can afford higher advertising costs. This is where LTV comes in. The higher your LTV is, the low your ROAS ratio can be for the short-term (understanding that the ratio will increase over time as the customer purchases additional items). Some businesses require an ROAS of 10:1 in order to stay profitable, and others can grow substantially at just 3:1. A business can only gauge its ROAS goal when it has a defined budget and firm handle on its profit margins. A large margin means that the business can survive a low ROAS; smaller margins are an indication the business must maintain low advertising costs. An ecommerce store in this situation must achieve a relatively high ROAS to reach profitability. In other words, if you have a low margin, LTV is more important to your business in order to achieve a higher ROAS ratio over time. Now, let’s take a look at 5 brands who are using S Loyalty, among other tools and tactics, to build customer loyalty and repeat purchases –– two measurements of a healthy LTV. Start using what more than 200 online stores use to drive customer loyalty and repeat purchases. All in one click. The Cloud Alchemist is a boutique vapor liquid brand based out of Seattle, WA. They design and produce their own products, from initial design, down to laboratory production. After speaking with Trevor Taylor, founder of The Cloud Alchemist, I learned that their ecommerce customer loyalty strategy is all about being personable and connecting with their customers, as demonstrated by how frequently they engage directly with their customers to add value. “I’ve talked with people about the birth of a new child, buying their first house, and losing jobs. I gave store credit to a customer who’s hard up, sent spare hard drives to someone building computers for those in need, and even traded a t-shirt in exchange for someone’s home-made jerky. They’re active in their community, participating in Reddit groups, gatherings, Facebook communities, and more. Their team is always transparent about who they work for and where their biases lie. But, getting in front of potential customers as often as possible helps your brand to be seen as a thought leader and a helper –– making that customer’s next purchase decision more likely to be with you. Here are a few other things The Cloud Alchemist does to increase customer lifetime value. A big part of being engaging is being relevant. Being relevant doesn’t mean you have to send an individualized and personalized email to every single customer. Instead, it means that we set up your automation streams to address people by their given name (if your form collects it) and prompts them to take an action relevant to the action they’ve just taken on your site. For instance, The Cloud Alchemist team emails new customers after a purchase, encouraging them to review the product for the vape community JuiceDB. JuiceDB is a leading community review site for the vape industry, and The Cloud Alchemist makes it clear to customers that their review –– good or bad –– cannot be altered by their team. Instead, the brand is dedicated to making sure the best flavors have the highest reviews in the community, despite which ones those are. After all, it helps to educate the entire industry. This is a great way for The Cloud Alchemist to get feedback, see what can be improved, improve customer satisfaction, and also gain exposure with public feedback that’s shared with the community. With every order that goes out, The Cloud Alchemist team includes a handwritten thank you message on their packing slips. Included alongside stickers, cards, and other branded items, they take this opportunity to thank the customer personally for this business. After all, every customer has a choice, and their choice impacts your bottom line. If they choose to do with you, especially in a crowded industry, take that extra step to thank them for their time and prove your dedication to them as a customer. It will often be returned. The Cloud Alchemist uses S Loyalty for their customer loyalty program solution. 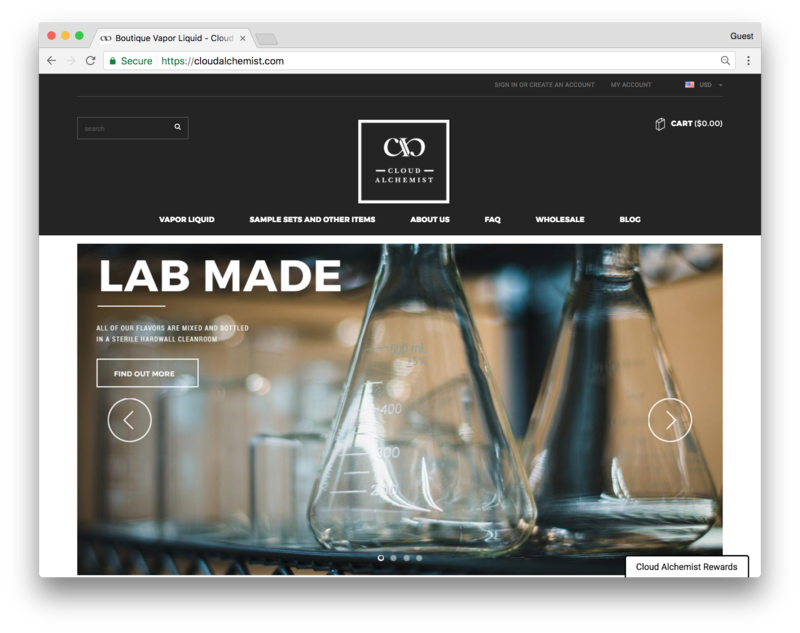 Like their approach to personalized emails, for their loyalty program, The Cloud Alchemist has turned on storefront notifications to showcase relevant reminders to shoppers about the loyalty program as they visit their site. Enabling notifications has helped them with more consistent loyalty program engagement and has increased engagement outside of the segment of users that already engaging with the program. “There were a handful of customers that religiously used their points as they accrued them (mostly at the $10-20 reward mark), but this year we also turned on the email feature to remind customers that they had points to spend 14 days after earning enough to redeem. Each of these customer loyalty strategies builds customer lifetime value for The Cloud Alchemist. This is especially important in a crowded industry, where customers have a plethora of choices when it comes to where to purchase. Be sure to give your customers a feeling of personalization so that when they buy again, they buy from you. Super Hair Pieces is a direct-to-consumer hair piece store. Providing a wide assortment of styles, sizes, and colors, they have one of the largest inventories of hair pieces available online. When I spoke with George Li about how they attracted a loyal following of repeat customers, it immediately became clear that their strategy is all about the product. By delivering great hairpieces at the best possible prices, Super Hair Pieces has created a fighting force within the hair pieces industry. The money they save with a lean strategy, they pass on to their customers. Here’s how it works. When a new potential customer comes to your site, it is better that they come at the recommendation of a friend rather than through an ad. Because social proof is incredibly valuable, and people believe that brands they are recommended to are better than others –– often even if they aren’t. 67% of consumers modify the brands/companies they purchase from in order to maximize points. Added both of those stats up –– and getting a loyalty program up and running for your business can mean serious $$$. Super Hair Pieces implemented a loyalty program two year ago. The savings that George can offer through points and rewards encourages customer retention, as well as referrals, and allows the brand to focus on delivering what they do best (selling a great product as an affordable price). Today, a healthy part of Super Hair Pieces’ customer base are loyal, repeat customers –– all without any major marketing campaigns. Swiss Rasoi is an online specialty grocery store that sells Indian spices and ingredients. They’re based in Switzerland and serve the Swiss market with free delivery, and a vast selection of spices and staples needed for Indian cuisine. They’ve created a colorful brand filled with quality images that reflect their product offerings –– i.e. Quality ingredients. This brand design is consistent across their online store, as well as, their social media channels, helping to reinforce a consistent, trustworthy message. Swiss Rasoi offers traditional products delivered right to your doorstep. With added conveniences like free delivery, unbeatable prices, and access to hard-to-find ingredients, they’ve created a brand where an increasing number of their customers come back to buy more. The Swiss community for authentic Indian spices and ingredients might have started as a small niche, but Swiss Rasoi is creating brand recognition throughout the Swiss food industry. By delivering their color branded images which reflect their offerings, they create content that’s immediately recognizable with clear callouts. In addition, every month, Swiss Rasoi hosts flash sales you can only find on their social media channels –– specifically Facebook. By offering discounts on their already great prices, flash sales create an urgency for their customers to come back, make more purchases, and add to the brand’s overall LTV value. The 6 tactics you need to know to make more $$$. In addition to offering their customers savings from offers and flash sales, Swiss Rasoi a loyalty program to give their best customers another avenue for saving on their quality ingredients. When free shipping and low prices are standard, offering additional discounts through a loyalty program is something extra that Swiss Rasoi can give back to their loyal customers. The more your purchase, the less you pay. Based in New Jersey, DBDPet became the largest dry goods vendor at reptile shows after just 6 years in business. It’s a classic startup story: they started in a garage with one bearded dragon that laid eggs. Now they are expanding beyond a 5,000 sq ft warehouse by breeding exotic animals, and offering supplies for every kind of pet. DBDPet realized, however, that it was difficult to explain where to buy supplies for the pets they sold. Today, they strive to be a one-stop shop for all reptile supplies while providing accurate and useful information about the nurturing and care for these pets. For DBDPet, their path to customer loyalty was built from their expertise and the steady stream of advice and content they deliver to their community. Customers that shop at DBDPet come for the supplies, but stay for the advice and knowledge. Social media became a way for Buddy and his team to spread their wisdom learned through years of experience in exotic pets. They create a constant stream of content for Facebook, Instagram and YouTube, which are essential for them to keep their current customers engaged, while helping to reach new ones. As DBDPet became a one-stop shop for exotic pets, their knowledge and expertise became the foundation of their customer loyalty strategy. By offering a broad range of products, they cater to every need of their customers. You can say they are the Amazon of exotic pet supplies –– and we all know how loyal Amazon shoppers are. DBDPet uses a loyalty program to further encourage customers to who their one-stop shop for all exotic pet and pet supply needs. Florida Colors Nursery is a staple in the Plumeria community. Currently offering more than 1,200 varieties, many of which are their own, they also focus on providing extensive knowledge on growing, grafting, and cultivating Plumeria plants. I briefly spoke with Tex Norwood, and it’s obvious that he and his team are fanatics about Plumeria flowers. Their customer loyalty comes from their thought leadership in the shared community around these flowers. 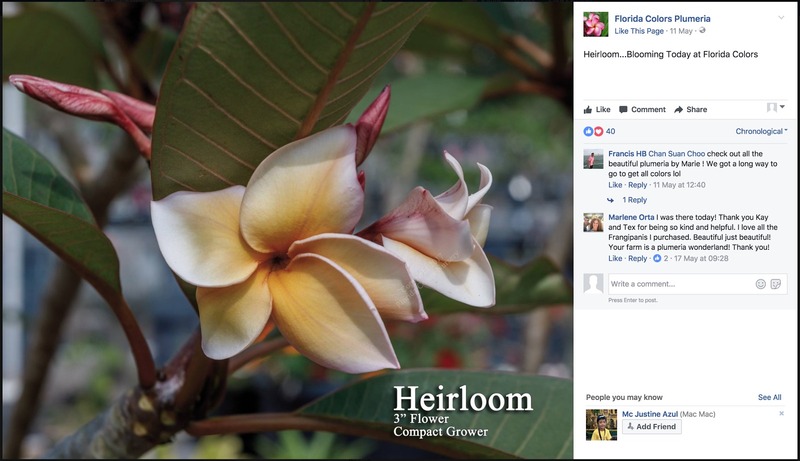 Alongside multiple properties about Plumeria, Social Media has been a primary outlet for sharing the beautiful photos of these plants. With so many colors, combinations, shapes, and sizes, each one is best cared for a little differently than the next. They’ve built a loyal following by sharing their latest cultivations, while providing best practices on how to care and keep them healthy. In total, they have thousands of followers within their community engaged with their Facebook page, community websites, and store. It’s immediately obvious that Tex and his business partners are experts when it comes to Plumeria. Customers can find an endless bucket of wisdom and knowledge to best grow, graft, cultivate, and enjoy these flowers. As for their loyalty program, customers are rewarded each time they buy, adding up to store credit and lower overall cost for the customer (plus great social referrals for the brand). These five stores each have a different approach to customer retention and customer loyalty –– ultimately leading to increased LTV –– which proves that there’s no one right way of keeping your customers engaged. However, the one thing that all of these have in common is that they offer something that resonates well with their customers. Whether that’s a wealth of expertise, affordable prices, or being passionate and personable; the lesson here is to treat your customers well, and they’ll return the favor. Kevin Chau is a researcher and writer at S Loyalty, where he works with online brands to build loyalty programs that grow their repeat business, and tells stories about their long-term success.